If you have ever wanted to reach out and pet a dolphin, then the Dolphin Meet N Greet is perfect for you. Enjoy petting, playing, and watching these energetic creatures with your friends and family of all ages. This is an exciting activity for learning and pure enjoyment! When traveling to Florida, there is nothing more exciting than enjoying the wildlife living in the water. While at Panama City Beach, you have the option to meet and greet one of the friendliest marine creatures: the dolphin. These fun and energetic creatures are a must-see for anyone interested in wildlife. 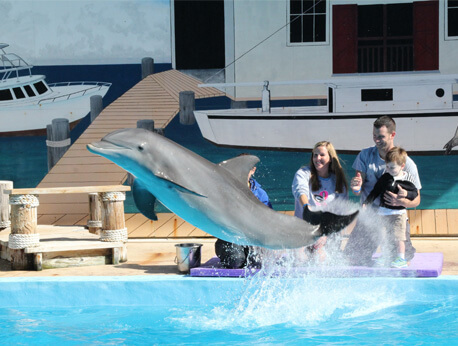 The Dolphin Meet N Greet is a great activity for kids and adults of all ages. These cute creatures are fun to touch, pet, and splash around with without having to go for a swim. From ages four and up, children are allowed to meet and greet these dolphins all by themselves. Dolphins are very friendly and docile creatures and embrace human interaction. These fun activities are a must for any bucket list. After enjoying this Meet N Greet, you and your loved ones can enjoy the Sea Lion Show, the Friends and Furry Show, and the 2016 Games Summer Games Show. These events are both entertaining and educational for all ages. Each show provides a unique perspective on animal life and allows for a vast array of activities to be enjoyed. Whether you want to stand up close and have a splash fight with these silly dolphins, or you want to stand back and watch them perform and play for you, seeing these dolphins is a must. In addition, various educational and entertaining events can be enjoyed. It is a great experience for families and friends of all ages and can be enjoyed in groups of varying size. So if you want to learn about and play with a dolphin, then this Dolphin Meet N Greet is a must.